When Trillium was originally homesteaded in 1869, a 7-mile hike down river led to the nearest dirt wagon road. A new wagon road used for constructing the Sterling Mine Ditch (now a 30-mile hiking trail system) was hand-built with ox carts in 1877, reaching further up the river canyon, a few miles past Trillium. The old ranch house dates from 1902, following a succession of log cabins. The county road was built up the Little Applegate canyon in 1938 by the Civilian Conservation Corps, providing year-round access for motor vehicles. During the 1950s into the mid 70s, Grandmas Trout Farm operated at Trillium, providing guest cabins and riverside camping for clients coming to fish, hunt, ride horses. Grandma's also operated a trout fishing school, where people would come to learn the fine arts of tying flies and casting on flat and moving waters. The modern age of electricity and telephone service arrived in 1960. After helping Grandma and her crew for several summers, Chant Thomas and some friends bought Trillium in 1976, and operated Trillium Trout Farm for three years until an extended drought ended the trout farm era. 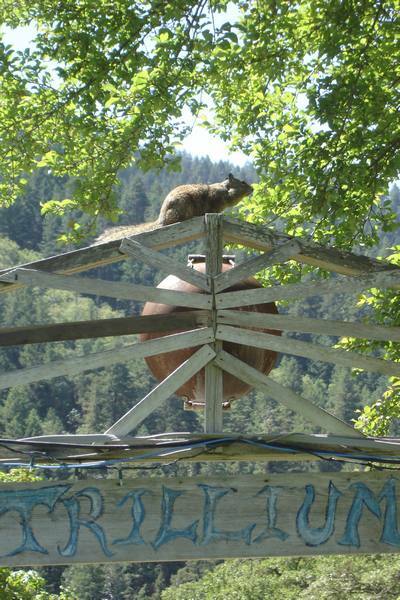 Now, in addition to growing organic vegetables, fruits and herbs, Trillium Farm functions as a wilderness campus, hosting Birch Creek Arts and Ecology Center, which operates an educational, cultural, spiritual, arts and retreat center deep in this wild river canyon in southwestern Oregon. People still come to relax and study, camping under river bank forest, camping in canyon meadows, or staying in rustic historic cabins. Trillium is presently 82 acres, deep in the eastern Siskiyou Mountains where Birch Creek flows through several ponds and over a waterfall into the Little Applegate River. A primitive footbridge is the only development in the river canyon, which serves as a primitive campground for our larger events. The river's riparian ecology is intact, providing excellent spawning habitat for coho salmon, lamprey, steelhead, river otter, and many riparian bird and insect species. Trillium serves as a wildlife sanctuary and as a place where humans can become comfortable with the power of wild country on a daily basis. An extensive trail system with over 30 miles of maintained hiking trails provides access to the proposed 21,200-acre Dakubetede Primitive Backcountry Area, a maze of remote canyons, high ridges, wet meadows, extensive steep grasslands, and virgin forests to explore. Sunny and dry in the rain shadow created by the highest peaks of the mythic Siskiyou Mountains, this spectacular area provides critical deer winter range and home to coyote, bear, bobcat, mountain lion, elk, river otter, birds of prey, nesting songbirds, and even endangered turtles living in ponds once used to raise Kamloops rainbow trout. Biodiversity is strong here with many diverse ecosystems draped in complex mosaics over the varied landscape. Rich forests of conifers and hardwood trees, including a rare birch, fill the canyons. The ridges are covered with steep meadows, oak woodlands, and diverse chaparral communities dominated by manzanita, ceanothus, and mountain mahogany. The north slope of Trillium Mountain rises over it all, providing splendid views of old-growth conifer forest. Many of the plant communities and individual species are near the edge of their natural ranges here, where the Siskiyous link the coast ranges to the west, the Cascade/Sierras to the east, and the Willamette and Sacramento valley systems to the north and south. The river, creek, and several ponds provide varied opportunities to study aquatic ecology. The complex geology of the Klamath Knot is evident here, with limestone and metamorphics interacting around Trillium, and extensive granitic and serpentine systems in nearby higher elevations along the Siskiyou Crest. Beyond educational opportunities, the power of the wild Nature in which we are embedded fills us with a even deep nourishment, a psychological blessing to compliment the clean water and clear air. This natural wildness provides an inspiration, a psychic grounding, a way to get in touch with our own wild natures; ecopsychology in action! Please do not bring your pets, especially dogs, to Trillium Farm, a wildlife sanctuary. Please write "Trillium Inquiry" in subject line of e-mail!